The War On Christmas. Also, Happy Solstice! – Jenny and Jonathan Got Married! The War On Christmas. Also, Happy Solstice! 20 December 2017 / Comments Off on The War On Christmas. Also, Happy Solstice! See, back in the 1600’s, the Puritans persecuted non-Puritans (and also other Puritans) over religious beliefs. Sound familiar? I’m sharing this story tonight because I know that history repeats itself. The week of the solstice is the perfect time mind this! 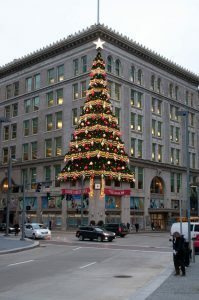 Also, in honor of the solstice, here is a photo of the old Horne’s Department Store in downtown Pittsburgh. I actually took this photo in 2014, but every holiday season – including this one – this tree decoration graces this building. One of my great-grandmothers worked in this building when it was Horne’s. An insurance company now owns the building, and occupies most of it. I now work directly across the street from this building, at a different insurance company. One time, at almost the same spot where I stood to take this photo, I ran into my aunt and my cousin. Another time, again at this spot, I ran into a different cousin from my other side of my family. Happy Solstice! But seriously, listen to the podcast.